While Poles had been settling in Western New York since the 1840s, none had made the eastern Wyoming County village of Perry home until about 1903. At that time Frank Narowski led a dozen men including Joseph Nawalski, Martin Watega, John Grodecki, Steven Slusarczyk, William Zawisza, Walter Tryka, John Starchurski and Frank Ryczek to Perry in search of work at the Perry Knitting Mills. Finding success they sent for their families who still lived in the Depew area. 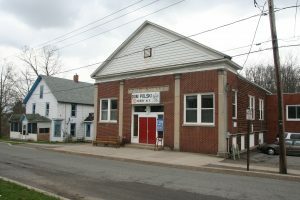 By the turn of the decade, the Polish community of Perry was 450 strong and now needed two things, a church and a social hall. The church came first, with the establishment of St. Stanislaus Kostka in 1910. Shortly thereafter, the first Dom Polski was opened. This two-story building with a dance hall on the first floor and 12 offices on the second, only served the community a short time, burning to the ground on October 19, 1913. It would take Perry’s Polonia eight years to fully recuperate from this tragic event. In January of 1921, Anthony Dec, Chester F. Jedrzejewski, Felix Kwiecien, Walter Odymala, and Szczepan Siembida held a meeting and decided it was time to revive the Dom Polski. The group began raising funds and collecting donations for the new home. Within three years it became necessary for them to incorporate, choosing the name, the Polish Home Association of Perry. In 1925, the group purchased a two family dwelling on Water Street in the heart of Perry’s Polish neighborhood and began remodeling the property. Half the building became club rooms while the other half served as living quarters to the building’s custodian. It soon became apparent that the meager facility was not nearly big enough for all the clubs and events of the community. It was decided to build a modern Dom Polski and architect Bronislaus A. Kalinowski of Buffalo was brought in to design the new home. 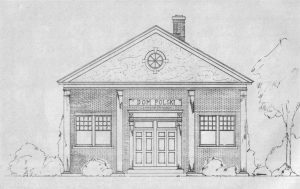 The plans Kalinowski came up with called for a two-story brick building measuring 65 feet long and 40 feet wide. The upper half was dominated by a large gathering hall with a stage in the rear, while the lower floor had space for small club rooms. On June 10, 1928, with much celebration and jubilation a groundbreaking ceremony for the new Dom Polski was held. Over 300 guests from across New York State descended on the small Wyoming County village for the event. It would only take six months for the building to be competed and January 20, 1929 a formal banquet was held officially opening it. 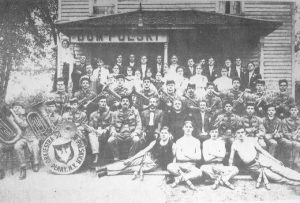 For the rest of the century, the home survived the hard times of the Great Depression, saw members fight in the Second World War, and enjoyed both the concerts of the Pirates Orchestra and the festive Dyngus Day celebrations. At the end of the 1980s, older members were dying off and there were fewer younger Poles that wanted to replace them. To survive, the home approved non-Polish members and the rolls went back up while still maintaining its Polish flavor. The turn of the millennium saw the Polish Home begin to slide. The first was the opening of the new casino, which cut into the once lucrative bell jar pull tabs that the home sold. Then the declining population of Perry began to be felt. With fewer younger people and even less that wanted to formally join the Dom Polski, the members and board decided to close its doors, holding its last event on January 16, 2014. "Annual Review of Year's Events In Perry and Vicinity Durning 1929." Perry Record [Perry, NY] 2 Jan. 1930: 1. Print. "Costly Fire in Polish Section." Perry Record [Perry, NY] 19 Jan. 1913: 1. Print. "Dom Polski Clubhouse—Completed Jan. 15." Perry Record [Perry, NY] 17 Jan. 1929: 7. Print. "Dom Polski Opens Community Hall." Perry Record [Perry, NY] 24 Jan. 1929: 1. Print. "Early Sunday Morning Fire." Perry Herald [Perry, NY] 22 Oct. 1913: 1. Print. "Friends Honor Dr. Bruno Tryka." Perry Record [Perry, NY] 28 Sept. 1939: 1. Print. "Heavy Fire Loss Sunday Morning." Perry Herald [Perry, NY] 18 June 1913: 1. Print. "Knowing Perry." Perry Herald [Perry, NY] 4 Nov. 1954: 2. Print. Konstytucja I Ustawy Stowarzyszenia Domu Polskiego. Perry, NY: Dom Polski, 1945. Print. "New Dom Polski Open To Public." Perry Herald [Perry, NY] 23 Jan. 1929: 1. Print. Pamietnik Stowarzyszenia Dom Polskiego W Perry N. Y. Perry, NY: Dom Polski, 1928. Print. ""Pirates" at Dom Polski." Perry Record [Perry, NY] 8 Oct. 1931: 5. Print. "Poles Celebrate." Perry Herald [Perry, NY] 16 May 1911: 1. Print. "Polish Groups Score Hitler." Perry Herald [Perry, NY] 6 Mar. 1940: 1. Print. "Polish Residents Break Ground For Their Own Community Center." Perry Record [Perry, NY] 14 June 1928: 1. Print. "Polish Uhlans. Branch No. 88." Perry Herald [Perry, NY] 2 Sept. 1914: 1. Print. "Raising Funds For A New Hall." Perry Herald [Perry, NY] 11 Mar. 1925: 1. Print. Roberts, Frank D. "Perry's Greatest Conflagration." Perry Record [Perry, NY] 4 Nov. 1915: 1. Print. "State Convention of Polish Women Will Be Held In Perry June 1st." Perry Record [Perry, NY] 22 May 1941: 1. Print. "Wildcat Wood Has Blood In His Eye." Perry Herald [Perry, NY] 24 Dec. 1930: 8. Print. "Will Burn Mortgage." Perry Herald [Perry, NY] 20 Oct. 1943: 5. Print. Witul, Gregory. "It Was a Sad May 3rd for Perry’s Dom Polski." Am-Pol Eagle. Am-Pol Eagle Newspaper, 20 May 2014. Web. 16 Nov. 2016.